It hurts you physically: Chronic anger makes you more susceptible to heart disease, diabetes, high cholesterol levels, a weakened immune system, insomnia, and high blood pressure. It hurts your mental health: Chronic anger consumes huge amounts of mental energy and clouds thinking, making it harder to concentrate, see the bigger picture, and enjoy life. It can also lead to stress, depression, and other mental health problems. It damages your career: Constructive criticism, creative differences, and heated debate can be healthy. But lashing out will alienate your colleagues, supervisors and clients. What’s more, a bad reputation can follow you wherever you go, making it harder and harder to get ahead. It hurts your relationships. Chronic anger causes lasting scars, and can create barriers between you and your loved ones. Your chronic anger can be difficult for those you love. Anger can create mistrust in others or may make it difficult for them to speak with you honestly. Chronic anger and behaviours associated with anger may cause others to shy away from connecting with you as it may be difficult for them to know how to feel safe and comfortable around you and your anger. Explosive anger is especially damaging to sensitive individual and to the children in your life. Anger is often a cover up. If your knee-jerk reaction to many situations is to get angry, it’s very likely your temper is covering up deeper feelings and needs. This is especially likely if you grew up in a family where expressing emotions was discouraged. 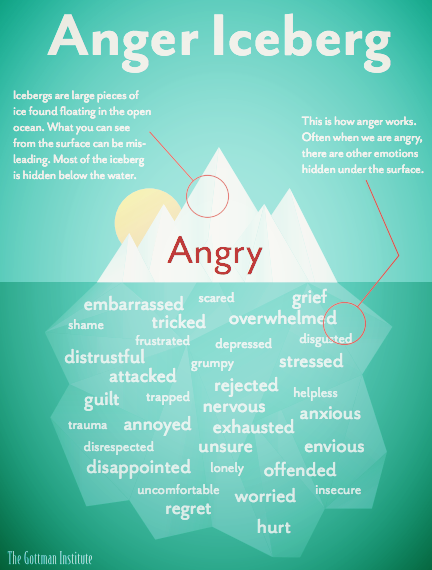 Anger may be the emotion you feel most comfortable accessing or expressing. Your anger may be trying to tell you something else is bothering you or that you are in need of some healthier boundaries. You won’t compromise. Is it hard for you to understand other people’s points of view, and even harder to concede a point? If you grew up in a family where anger was out of control, you may remember how the angry person got their way by being the loudest and most demanding. Compromising might bring up scary feelings of failure and vulnerability. You have trouble expressing emotions other than anger. Do you pride yourself on being tough and in control, never letting your guard down? Or maybe you feel that emotions like fear, guilt, or shame don’t apply to you? Everyone has those emotions. If you think you don’t have them, you may be using anger as a substitute for other emotions. You view different opinions as a personal challenge. Do you believe your way is always right and get angry when people disagree? If you have a strong need to be in control or a fragile ego, you may see other perspectives as a challenge to your authority, rather than simply a different way of seeing the world. We can help you manage your anger. If you have a temper, it might feel like there’s little you can do about it. Perhaps you have just come to see this version of yourself as the only possible version. But you have more control over your anger than you think. Some people worry about asking for help because there can be stigma around it. You may believe asking for help is a sign of weakness, or worry about how others will see you. The truth is that there’s nothing “wrong” with you. We all need help at some point or another. By getting support to help process your anger in a healthy way, your life will get better. After you contact our office, we’ll work together to understand the reasons behind your anger, so that we can develop a plan to move beyond it. It is possible to overcome your quick temper, and process life without getting angry. Learning to control your anger and express it appropriately will help you build better relationships, achieve your goals, and lead a healthier, more satisfying life.